The Rolling Stones, Robbie Williams, Bon Jovi and Take That have been forced to move concerts from the new Wembley Stadium because of building delays. 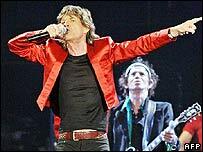 The Rolling Stones' shows on 20 and 22 August will take place at Twickenham rugby stadium, south-west London. Bon Jovi's gigs on 10 and 11 June and Take That's concerts on 24 and 25 June will happen at the Milton Keynes Bowl. There has been no announcement yet about new plans for Robbie Williams' five Wembley dates in September. A statement from Wembley said: "No major events will take place at the stadium for the remainder of this year." Building company Multiplex said "full practical completion" of the rebuilt stadium would not be achieved until the end of September. Another two months are needed to run test events, Wembley said. The venue's opening event was due to have been the FA Cup final on 13 May. An Football Association statement said: "It is clear that the construction of Wembley Stadium is significantly behind schedule." All original tickets for the relocated Take That and Bon Jovi concerts will remain valid, while Rolling Stones ticketholders will be issued with new tickets for Twickenham. The Rolling Stones' European tour promoter John Giddings said it was a "national disgrace" that England could not build its national stadium on time. "I'm not saying we're going to lose money because we got enough warning to shift the shows," he told BBC Radio Five Live. "But it's not a good experience to sell tickets for one place and to have to perform at another, really is it? "We wanted to play at the new all-singing, all-dancing Wembley Stadium." Bon Jovi were the last band to play at the old Wembley Stadium in 2000 and had hoped to be the first to headline the rebuilt venue. 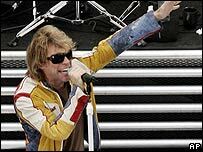 "Having closed the original Wembley Stadium, it would have been a fitting honour to open the new one," frontman Jon Bon Jovi said. "However, the most important element was always the live concerts themselves. So while the location may have changed, the celebration will remain the same. "Thank you to our fans - for your loyalty and your patience. We'll see you for two great nights of rock 'n' roll at Milton Keynes." A "limited number" of extra Take That tickets will go on sale on 7 April due to extra capacity at Milton Keynes. Singer Gary Barlow said: "We're more than happy to hold the shows at Milton Keynes Bowl, it's going to look great. "We saw the stage set this week, it's unbelievable. I think it's going to better any of our other tours." The reformed pop group's dates at Wembley Arena are not affected. A spokesman for Robbie Williams said: "Wembley Stadium today announced that they will not be able to accommodate the scheduled run of events for autumn 2006 including the Robbie Williams concerts. "Alternative arrangements for Robbie's Wembley dates are being made and an announcement as to the venue will be made as soon as the details are confirmed." Are you disappointed about Wembley?